The Smart Campaign is proud to announce the launch of its first-ever e-learning course, which allows industry professionals to experience interactive simulations of a series of scenarios involving client protection and financial education in microfinance. The course’s initial scenario takes participants to Occlo, a microfinance institution in a fictional country, which is facing troubles due to client distrust, limited staff experience, political strife, and other issues. The user is challenged to reduce the impact of these factors and improve Occlo’s situation. The course was created to make the case for client protection and financial education, and to assist users in thinking about ways to implement the Client Protection Principles in their own organizations. “I think the course we developed meets both of these goals, both by giving the user an opportunity to see the impact of these principles on a microfinance organization, and by exposing them to ways that they could consider implementing the principles in their own organization,” said e-learning developer Amanda Warner, who created the module in collaboration with a team from ACCION International and the Smart Campaign. The team from ACCION International and the Smart Campaign wrote the initial simulation scenario that sets the context for the rest of the course. In the two mini-simulations that follow, the user makes decisions to improve Occlo’s overall outlook, first as a manager and then as a loan officer. The user’s choices change key indicators of success, including client trust, client financial education, and overall financial outlook. 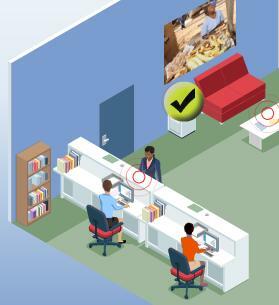 In the management simulation, the user’s decisions help craft overall policy, affect the bottom line, and shape Occlo’s relationship with their clients and the general public. 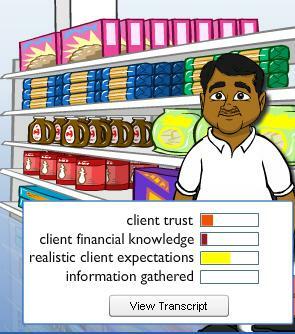 In the loan officer simulation, the user’s decisions determine whether a prospective client decides to apply for a loan with Occlo, and whether he ultimately successfully completes payments on that loan. You can enter the simulation by clicking here. Become the manager of Occlo, and then accompany loan officer Milo in his attempt to give a loan to Mr. Patel.